The incident — which included the astonishing rescue of two people trapped inside a car by a tangle of live wires and a pole that had smashed through the windshield — raises questions: Why did poles break on the west side of the six-lane road but not the east side? Why would so many topple together? Were they carrying an excessive weight or number of distribution lines? Some visitors to the museum’s West Campus Aviation Pavilion were stuck for a couple of hours, until emergency crews could de-energize hot wires and rescue the trapped motorists first, said visitor Jackie Ly, who said she was aboard a display 787 Dreamliner that went dark. “We felt the airplane just moving. For me it was like an earthquake,” she said. The Museum of Flight was open Saturday, but its Charles Simonyi Space Gallery and pavilion, both without power, remained closed until further notice. Raisbeck Aviation High School, next to the pavilion, is on spring break. The age of the broken poles wasn’t readily available, but Smith said she expected to have details by Monday. An average life span of wooden poles is 45 years, which can be extended with maintenance, according to the North American Wood Pole Council, which classifies Puget Sound as a “high deterioration zone” because of the climate. Smith, confirmed as CEO by the City Council in October, said she’s familiar with coastal weather from her past work in Newport, Oregon. Street clearing and power restoration moved faster than City Light initially expected. Some 16,000 customers in Burien, White Center, Tukwila and Seattle’s South Park and Georgetown areas were back online by 6 p.m. Friday, and most of the remaining 300 had power back by Saturday. 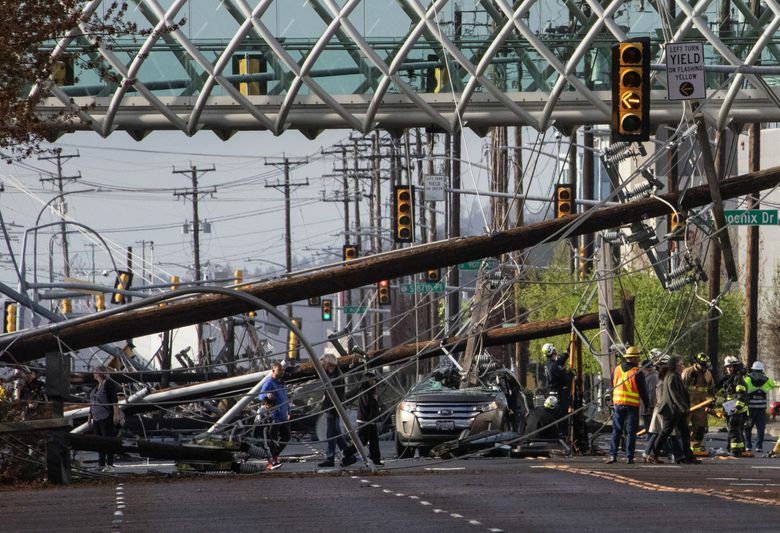 Smith was gratified City Light’s network was robust enough for power to be rerouted Friday night into affected neighborhoods and companies, along the Duwamish River. With so many poles gone, officials will take the opportunity to re-engineer the area, to best serve the network and customers such as Boeing, she said. Temporary wiring is likely, and might be installed as soon as Tuesday, she said. Smith ruled out any emergency budget increase or rate hikes for the Marginal Way response, saying City Light will save money somewhere else. City Light recently finished a six-year program to replace 867 worn-out streetlight poles, its current strategic plan says. The 2019 budget shows about $2.5 million yearly for ongoing retrofits of overhead lines, including rotten poles. Others can be replaced as the city extends service to new or growing businesses. Meanwhile, the city is finishing a shiny $210 million Denny Substation with park space, to serve booming South Lake Union internet companies. Smith said she was already wondering whether the right amount of money is devoted to maintenance and comparing Seattle to other cities. Friday’s incident heightens the importance of that review. Wooden poles in the Duwamish area and across the city are being properly monitored and the public shouldn’t fear more collapses, Smith said. “Maybe it was a fluke,” she said of Friday’s incident. If anything, it will cause the city to look harder at the age of its infrastructure and maintenance needs, she pledged.